11 Best Empire Strikes Back Moments: Why It's Our Favorite Star Wars Movie! The Empire Strikes Back is largely considered the best of the series. It is Movie Fanatic's favorite Star Wars movie, that is for sure. There are so many plot points, hero moments, and of course given the film's title, villainous victories that show how heading to the dark side can be a great cinematic experience. 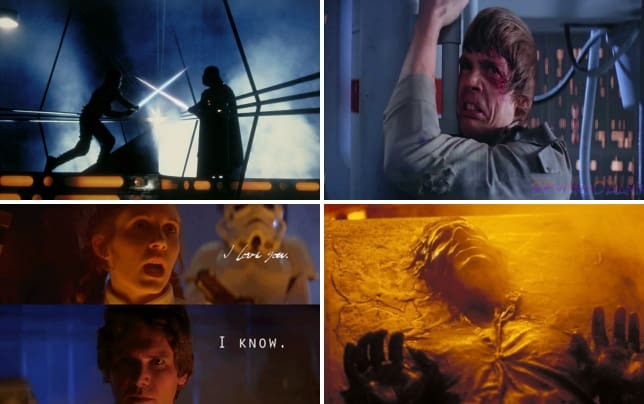 Click through our 11 The Empire Strikes Back moments that make it the best Star Wars movie and discover why The Empire Strikes Back quotes are simply only one reason why this film rules the George Lucas galaxy. Darth Vader: He's all yours, bounty hunter. What Are The 11 Best Empire Strikes Back Moments?